Each Box contains Three Autographs or Memorabilia Cards and Five Numbered Parallels! Look for 10 Rated Rookies and 15 Diamond Kings Per Box, on average! Each year we bring in fresh inserts and 2019 is no different, featuring Highlights, Action All-Stars and Franchise Features. Our ultra rare Whammy insert is back with 5 new subjects! 2019 marks baseball's 150th Anniversary! Donruss will honor this historic year with an exclusive parallel printed on a classic clay coat stock. 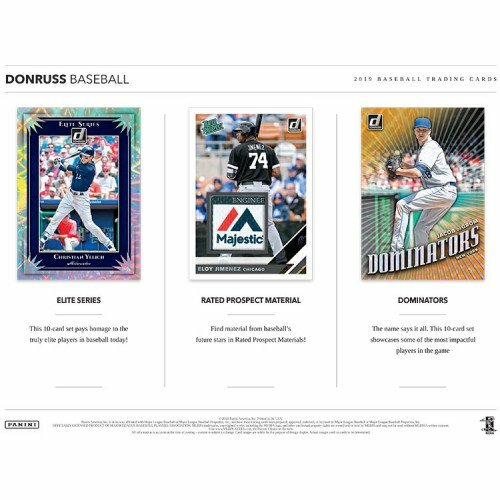 BASE 150TH ANNIVERSARY: Our deepest Donruss checklist to date, look out for our 150th Anniversary parallel, which commemorates baseball's 150 years! SIGNATURE SERIES: This autograph set includes some of baseball's brightest young stars. 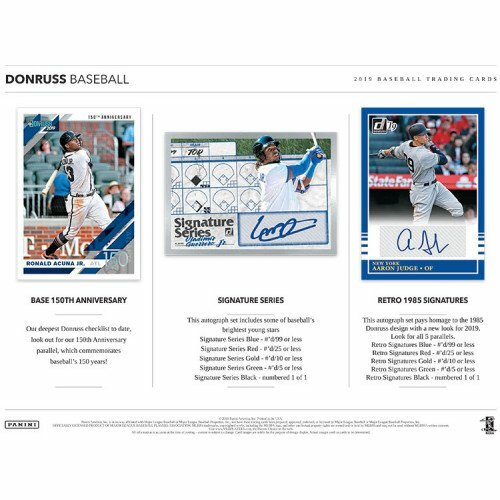 RETRO 1985 SIGNATURES: This autograph set pays homage to the 1985 Donruss design with a new look for 2019. Look for all 5 parallels. 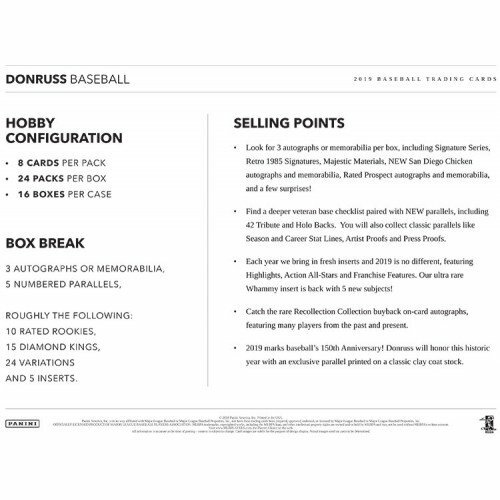 DIAMOND KINGS: No Donruss set would be complete without hobby staple Diamond Kings. 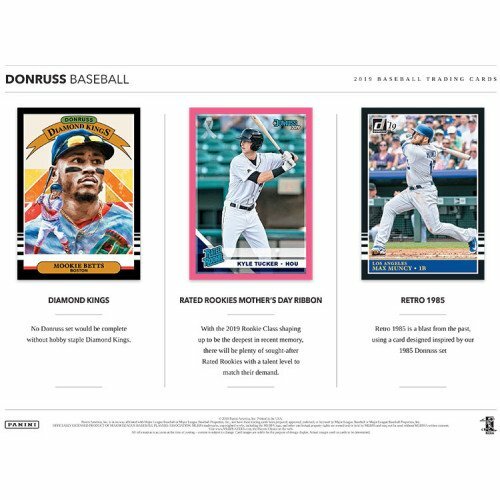 RATED ROOKIES MOTHER'S DAY RIBBON: With the 2019 Rookie Class shaping up to be the deepest in recent memory, there will be plenty of sought-after Rated Rookies with a talent level to match their demand. RETRO 1985: Retro 1985 is a blast from the past, using a card designed inspired by our 1985 Donruss set. ELITE SERIES: This 10-card set pays homage to the truly elite players in baseball today! RATED PROSPECT MATERIAL: Find material from baseball's future stars in Rated Prospect Materials! DOMINATORS: The name says it all. This 10-card set showcases some of the most impactful players in the game.